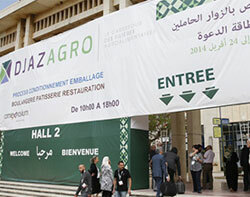 Storci took part in the Djazagro Trade Exhibition in Algiers, at the Safex Exhibition Park Algiers, from 20 to 23 April 2015. It was attended by large numbers of visitors from Algeria and the rest of the world: demand was strong and varied, both as regards our couscous lines, as well as for the rest of our production, systems and machinery for dry and fresh pasta, ready meals and gluten-free pasta. Our very latest addition encountered great interest: instant pasta lines. Sales Area Manager for the Maghreb, Giovanni Strinati, who was at the fair, says that Storci has once again confirmed its position of sector leader: "We are highly satisfied with the results obtained, we had many requests for offers of our lines and the visitors to the fair were very interested. We came away with a lot of new contacts. The fair was an excellent opportunity for us to see our best customers and discover new ones; our technology, always mindful of the concept of tradition, encountered great interest".